Israeli Defense Forces shot down a suspicious unmanned object which was flying over the Dimona nuclear reactor in southern Israel, the Jerusalem Post reported. An Israeli fighter jet carrying two crew members crashed Wednesday night in southern Israel while on a routine training flight, the military said. 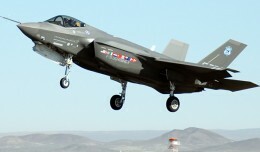 Israel will purchase 20 fifth-generation F-35 stealth jets from the U.S. for almost $2.75 billion, receiving the first jet some time between 2015 and 2017, at $96 million per plane.